Take the new EMS Orbital Specimen Holder for a spin and raise your SEM images to a whole new level. Experience flexibility and control superior to any other specimen holder. This unique holder is a tool no SEM laboratory should be without. The EMS Orbital Specimen Holder's clever design allows you to effortlessly rotate the specimen completely around an axis. The pot is coated to reduce noise, producing a black background behind the subject so every detail stands out, allowing the capture of stunning, clear images. This 24-place holder is made from aluminum and offers a stage travel of 100 mm x 50 mm (which is perfect to be used with the Hitachi VP SEM). 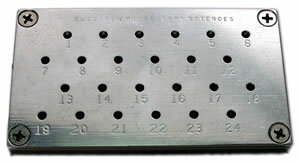 The holder has a unique identification number so every hole is identifiable. The holder measures 4 7/16" (112.7 mm) x 2½" (63.5 mm) x ⅜"(10 mm) (L x W x H) and has an ⅛" (3.2 mm) mounting pin. Our specimen holders are designed to improve your productivity and allow you to view more than one sample at a time. You will save pump down time, keep your chamber cleaner and get more work done. All mounts are machined from solid aluminum and come with spring clips/or setscrews to hold your specimens securely. All mounts are made to fit onto your stage and are designed to fit through all standard specimen exchange ports, and have a center-threaded port to accept the Adapter Pins. Be sure to order the Adapter Pin that fits your instrument. For this reason, we offer three different types of pin adapters, which are threaded and ready to screw on to the base of the holders. All adapters have a threaded portion 5 mm in length. This holder will hold almost any sample from 3 mm to 29 mm in diameter plus various odd shaped samples, which one of their dimensions is not greater than 29 mm. The samples are easily inserted or removed from the holder. The holder is made from aluminum and is supplied with four removable sample arms so that it can hold very small samples as well, and it provides good electrical contact to the stage. The AMRAY base is the standard base and it measures: 48 mm x 42 mm x 12 mm Thick. For all other makes and models you can choose an Adapter Pin to screw on to the AMRAY base holder. This holder is designed to hold thin samples vertically in the SEM or any microscope. It is 25 mm in diameter and 10 mm thick. Each of the two loader jaws can hold up to 3 mm thick samples. The spring loader keeps thin samples vertical so that cross sections can be studied. This holder is very useful for cross sections of silicon wafers or multilayer capicators. This holder can be adapted to any adapter pin listed above to accommodate your instrument. The Multi Pin Holder is designed to save time. It accommodates 3 or 5 of ½" (12.5 mm) diameter surface, ⅛" (3.1 mm) diameter pin. 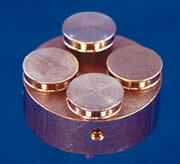 It is 10 mm in diameter, 5 mm high, copper sample holder to fit in the first stage of the ISI DS 130 and 150 SEM's. The inner cylinder is height adjustable so that you can adjust the sample to the correct working distance. For your convenience we now carry a SEM Sample Holder Set to fill all of your needs. The set consists of one universal holder, one vertical mount holder for thin samples, one 3-pin and one 5-pin configuration holder with a key for the set screw all in a finely finished wood box. Please specify the base requirement for your instrument when ordering. Delivery time on this item is approximately 2 weeks. Our aluminum stub holder offers many uses, including holding ⅛" (3.1 mm) pin stubs for freeze drying. Offers good thermal conductivity and may also be used for carbon or metal coating. Diameter: 38 mm (H) with five holes to hold five pin stubs. This aluminum adapter will convert ⅛" (3.1 mm) pin stub holders to the re-entrant type 1¼" (32 mm). A simple ALUMINUM holder which will hold ⅛" (3.1 mm) pin stubs on one side, or any other solid stub in the other side. Useful for specimen preparation, coating, freeze drying, as well as storage. 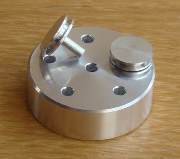 An interlocking 25 mm diameter sample holder for bulk specimens. The material is plunged into cryogen and transferred into the precooled sample holder. Using the handling tongs, the pots can be syacked onto a freeze drying Stage. Allows safe handling of valuable low temperature specimens whilst minimizing temperature fluctuations. A larger SEM sample holder for larger samples. Available for all microscopes – Four sizes available. A standard carousel holder made to fit Cambridge SEMs. Will hold 8 pin stubs. Comes complete with hexagonal wrench. Universal adapter to fit Cambridge SEMs which then accepts interchangeable multi carousel, single pin stubs, or re-entrant stubs. A useful tool for assisting in loading and unloading SEM pin stubs from a loading stand or specimen box into the microscope. It features a Perspex handle with beryllium copper pins that give the tool a flexible, but stable, grip on the specimen stub. Circlips are for all EMS TEM sample holders and specimen rods. They are made from heat treated Beryllium copper. The stainless steel Circlip extraction tool is for removing our Circlips from all TEM sample holders. Freeze drying holder to hold 24 standard TEM grids. A single tilt two-grid sample holder. Grids are held in place by easy to remove circlips. Comes complete with loading stand, circlip extraction tool, and is supplied in its own mahogany box. A single tilt multi-grid holder. Will accommodate 4 grids with easy reproducible movement between each specimen. It is ideal for scanning through serial samples or for comparing against standards. Grids are held in place by easy to remove circlips. Comes complete with loading stand, circlip extraction tool, and is supplied in a mahogany box. Suitable for 400 and non-compustage microscopes. A single tilt single sample holder. Will accommodate 3 mm grids. Grids are held in place by easy to remove circlips. Comes complete with loading stand, circlip extraction tool, and is supplied in its own box. Suitable for 400 and non-compustage microscopes. A single tilt multi-grid holder. Will accommodate 3 grids with easy reproducible movement between each specimen. It is ideal for scanning through serial samples or for comparing against standards. Grids are held in place by easy to remove circlips. 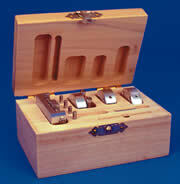 Comes complete with loading stand, circlip extraction tool, and is supplied in a mahogany box. A single tilt multi-grid holder. Will accommodate 6 grids with an easy click stop reproducible movement between each specimen. It is ideal for scanning through serial sections or for comparing against a standard. Grids are held in place by easy to remove circlips. Comes complete with loading stand, circlip extraction tool, and is supplied in its own mahogany box. A single-tilt multi-functional sample holder. For use in either SEM or TEM modes. 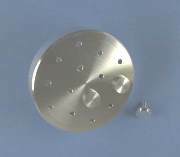 Includes slit serial section tip, 10 bulk, and a TEM 3.05 mm grid holder for use with TEM or STEM. Comes supplied in its own mahogany box, with a loading stand, and a circlip extraction tool. A three position insert which will fit standard JEOL 2 position holders as a direct replacement. Specimens are held in place with our push fit, easy to use circlips. The circlip extraction tool, Cat. #EMS016 is needed to install and remove circlips. A simple to use adapter which will convert Hitachi, JEOL or ISI microscopes to use ⅛" pin stubs or Cambridge stubs. Made of aluminum with spring retainers which will give a good connection. Used to adapt ⅛" (3.1 mm) pin diameter SEM stubs. Made from vacuum grade aluminum with stainless steel set screw. Allen wrench included. Made from non-magnetic stainless steel with 3.1 mm (⅛") diameter pin and adjustable angle turn-screw. Just insert specimens edge-on and observe the cross section directly. It accommodates four pin type, up to 12.5 (½") surface specimen stubs, with ⅛" (3.1 mm) diameter pin. Ideal for examination cross section of thin samples, such as wafers, multi-layer of capacitors, plastics, metals, etc. For most AMRAY: ½" diameter (12.7 mm), ⅛" (3.1 mm)dia. pin (3.1 mm) with split openings up to ¼" (6.4 mm). Available with either 8 mm (5/16") pin height or 15 mm (9/16") pin height. For ISI, JEOL, TOPCON: Double set screw for a secure holding of the specimen during observation. 15 mm (9/16")(dia). x 10 mm (3/8")(H), 6.4 mm (1/4") split. Accommodates up to 31.8 mm (1¼") diameter of a metallurgical specimen with at least 0.8 mm (⅛") clearance. Pin 3.1 mm (⅛"), depth is 8 mm (5/16"). A single set screw loading vise for fast and easy to hold specimens for SEM. The jaws are 1" (25 mm) long, 7/16 (11 mm) wide and 5/16" (8 mm) high. 1.8"(3.1 mm) pin. 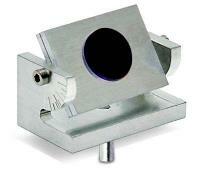 This tilt mount, made from aluminum, is used for the mounting and tilting of samples from 0°-90° in 10° increments. Allows for pin stubs up to 18 mm and fits specimens with a maximum size of 26 mm x 22 mm. Comes complete with screws and allen wrench. This EMS new release allows for the holding of up to 4 grids. Made from aluminum with a brass screw this holder allows you to image and analyze specimens on TEM Grids in the SEM. The overall diameter of the holder is 0.7" (18 mm) with a ⅛" diameter pin (3.2 mm) which is 0.6" (15 mm) long. The grid locations are all numbered. This multi pin stub adapter for JEOL 32x11 mm is designed to save time. It is made from vacuum aluminum with stainless steel set screws. It accommodates up to fourt standard 12.7 mm (½") pin stubs with 3.2 mm (⅛") pin. This 42 mm in diameter multi pin holder is designed to save time. It is made from machined aluminum with stainless steel set screws. It accommodates up to six standard 12.7 mm (½") pin stubs with 3.2 mm (⅛") pin. 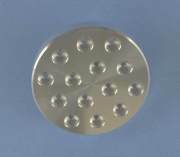 This 50 mm in diameter multi pin holder is designed to save time. It is made from machined aluminum with stainless steel Allen wrench screws. It accommodates up to eight standard 12.7 mm (½") pin stubs. Last image shows the Built-in Dovetail feature of the Zeiss holder. 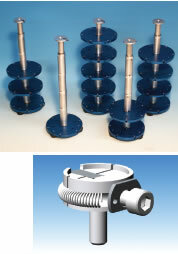 This 62 mm in diameter multi pin holder is designed to save time. It is made from machined aluminum with stainless steel Allen wrench screws. It accommodates up to twelve standard 12.7 mm (½") pin stubs. Last image shows the Built-in Dovetail feature of the Zeiss holder. 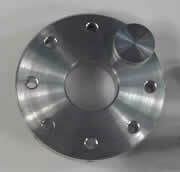 This 117 mm in diameter multi pin holder is designed to save time. It is made from machined aluminum with 302 stainless steel springs that hold the pin stubs in place. It accommodates up to forty nine standard 12.7 mm (1/2") pin stubs. This 45 degree pin stub holder allows for a higher SE signal without having to tilt the specimen stage and it accommodates any standard 12.7 mm (½") pin stubs with 3.2 mm (⅛") pin.. Grooved, machined aluminum with stainless steel Allen set screw. This 25.4 mm in diameter 45 Degree multi pin holder is designed to save time. It allows for a higher SE signal without having to tilt the specimen It is made from machined aluminum with stainless steel Allen set screws. It accommodates up to three standard 12.7 mm (½") pin stubs with 3.2 mm (⅛") pin. This 35 mm in diameter 45 Degree multi pin holder is designed to save time. It allows for a higher SE signal without having to tilt the specimen It is made from machined aluminum with stainless steel Allen set screws. It accommodates up to six standard 12.7 mm (½") pin stubs. This set screw vice which is made from machined aluminum with stainless steel allen set screws has an open slot that is 4 mm (.157") wide x 5 mm (.197") deep. It measures 12.7 mm (½") dia. x 17.7 mm (0.70") high. And has a 3.2 mm (⅛") dia. pin. This set screw vice which is made from machined aluminum with stainless steel allen set screws has an open slot that is 10 mm (.394") wide x 5 mm (.197") deep. It measures 25 mm (1") dia. x 17.5 mm (0.69") high. Double-slot set screw vise with (2) 1 mm wide x 3 mm deep slots. Clamp thin specimens or cross sections. Effectively holds wafers and thin samples up to 1 mm (.039") thick. Dimensions: 15 mm dia x 6 mm H.
Material: Aluminum with 2 stainless steel allen set screws. Large double-slot set screw vise with (2) 2.5 mm x 5 mm deep slots. Clamp thin specimens and cross sections without conductive paint or tape. Dimensions: 25 x 10 mm (1 x 0.4"). Material: Machined aluminum with 2 stainless steel allen set screws. 32 mm large double slot set screw vise with (2) 2.5 mm wide x 5 mm deep slots. Clamp thin specimens and cross sections without conductive paint or tape. For Hitachi S-800, S-4000, S-4100, S-4200, S-4300, S-4500, S-4700 and S-3600N SEMs. For cross sections up to 6.35 mm (¼"). Available in aluminum or brass with stainless steel allen set screws. These wafer holders are made from aluminum and feature brass clips which secure the wafers. Each holder comes with a ⅛" (3.2 mm) pin of ⅜" (9.5 mm) length. Available in six sizes to accommodate a variety of wafers. These wafer holders are made from aluminum and feature brass clips which secure the wafers. Each holder comes with a ⅛" (3.2 mm) pin of ⅜" (9.5 mm) length. Available in two sizes to accommodate a variety of wafers. 12.7 mm (½") dia., 3.2 mm (⅛") dia. pin. For examination of thin samples from paper, plastics, metals, textiles, plants, etc., in cross section. Features a wide opening up to 6.4 mm (¼"). Grooved head. Height of head is 7.4 mm (0.29"). Pin Length: 8 mm (.314"). Pin is centered. Material: Machined aluminum with stainless steel allen set screw. 15 mm (0.59") dia., 3.2 mm (⅛") dia. pin. Opens to 3.75 mm (⅜"). Pin length: 14.3 mm (9/16"). Height of head: 10.2 mm (0.4"), centered split. Pin is off-center. Material: Machined aluminum with two stainless steel allen set screws. Features (2) 1 mm wide x 3 mm deep slots. Clamp thin specimens and cross sections without tape or conductive paint. Pin Length: 3.2 mm (⅛"). Features (2) 2.5 mm by 5 mm deep slots.Clamp thin specimens and cross sections without conductive paint or tape. Dimensions: 25 x 8 mm (1 x 0.32") with 3.2 mm (⅛") pin. This mount holder which is made from machined aluminum with stainless steel Allen screws is specifically for 1" or 25 mm metallurgical mounts. This mount holder which is made from machined aluminum with stainless steel Allen screws is specifically for 1¼" and 30 mm metallurgical mounts. This mount holder which is made from machined aluminum with stainless steel Allen screws is specifically for 2" and 50 mm metallurgical mounts. Made from aluminum, this EBSD Holder has a built-in 70° pre-tilt angle and accommodates 1" (25 mm) mounts. Comes complete with stainless steel screws and allen key. 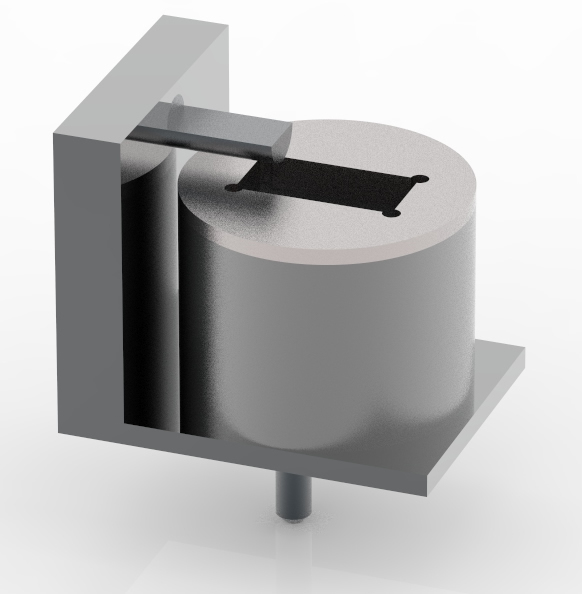 Made from aluminum, this EBSD Holder has a built-in 70° pre-tilt angle and accommodates 1¼" (32 mm) mounts. Comes complete with stainless steel screws and allen key. This thin section holder is made from aluminum with copper clips and brass screws. The unit measures 55x30x8 mm and holds a standard geological thin section or slide measuring 47 x 27 mm. The holder comes complete with 2 clips to insure nothing moves. The holder has convenient tweezer inserts which allow for easy loading. This thin section holder is made from vacuum grade aluminum with copper clips and brass screws . The unit measures 51x32x8 mm and holds either standard thin sections of 47 x 27 mm or smaller or larger thin sections. Smallest size would be 40x20 mm. The holder comes complete with 2 clips to insure nothing moves. The holder has convenient tweezer inserts which allow for easy loading. This thin section holder made from aluminum with copper clips and brass screws. The unit measures 55x58x8 mm and it holds two standard geological thin sections or slides of 47 x 27 mm. The holder has convenient tweezer inserts which allow for easy loading. Clips are provided for secure holding. This thin section holder made from aluminum with copper clips and brass screws. The unit measures 107x58x8 mm and it holds four standard geological thin sections or slides of 47 x 27 mm. The holder has convenient tweezer inserts which allow for easy loading. Clips are provided for secure holding. Holds up to 2 FIB grids of the same thickness. Handy FIB grid holder on a standard 12.7 mm (½") pin stub. Can also be used to safely store FIB grids with thin sections attached. Overall Dimensions: 12.7 mm (½") x 7.8 mm (0.3 mm) H w/o pin. Pin: Standard 3.2 mm (⅛"). Material: Vacuum grade aluminum with brass screw. Holds a FIB sample mounted on standard ½" (12.7 mm) pin stub for FIB milling and lift-out procedures. Conveniently holds two FIB grids close to the sample to mount prepared TEM lamellae on the FIB grid for TEM imaging. Cost-effective holder suitable for all FIB/SEM systems which accept pin mount holders, including the FEI, ZEISS and Tescan systems. For the JEOL and Hitachi systems, use a pin mount adapter. Overall Dimensions: 22.4 x 12.7 x 11.7 mm (0.88" x 0.5" x 0.46"). Material: Vacuum grade aluminum with brass screws. 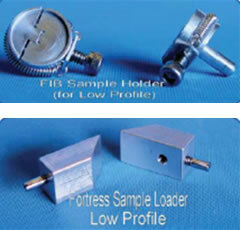 Holds a FIB sample mounted on two standard ½" (12.7 mm) pin stubs for FIB milling and lift-out procedures. Conveniently holds two FIB grids close to the sample to mount prepared TEM lamellae on the FIB grid for TEM imaging. Cost-effective holder suitable for all FIB/SEM systems which accept pin mount holders, including the FEI, ZEISS and Tescan systems. For the JEOL and Hitachi systems, use a pin mount adapter. Overall Dimensions: 36.5 x 12.7 x 11.6 mm (1.44" x 0.5" x 0.46"). Larger size enables this FIB grid holder to handle multiple FIB grids of the same thickness. Can also be used to safely store FIB grids with thin section (lamellae) attached. Convenient brass thumbscrews make loading and unloading easy. Overall Dimensions: 22.5 x 29 x 13.5 mm (⅞" x 1⅛" x ⅝"). Material: Vacuum grade aluminum with brass thumbscrews. Holds an FIB sample mounted on a standard 25 mm (1") pin stub for FIB milling and lift out procedures. Can also be used to hold FIB grids of the same thickness to mount the prepared lamellae on an FIB grid for TEM imaging. This cost-effective and versatile holder is suitable for all FIB/SEM systems which accept pin mount holders, including the FEI, ZEISS and Tescan systems. For the JEOL and Hitachi systems, use a pin mount adapter. Convenient brass thumbscrews make loading and unloading easy. Overall Dimensions: 50 x 29 x 13.5 mm (2" x 1⅛" x ⅝"). For clamping irregular, bulky samples. Opening: 15.9 mm (⅝") wide x 25.4 mm (1") long x 9.5 mm (⅜") deep. Pin Diameter: 3.2 mm (⅛"). Material: Machined aluminum with stainless steel allen set screws. Opening: 32 mm (1¼") wide x 32 mm (1¼") long x 13 mm (½") deep. Holds up to 2" specimens. Opening: 52 mm (2") wide x 40 mm (1½") long x 13 mm (½") deep. Holds up to 3" specimens. Opening: 80 mm (3⅛") wide x 48 mm (1⅞") long x 13 mm (½") deep. Mini SEM Clamp on a standard 12.7 mm (½") pin stub. Suitable for holding flat or thin specimens such as silicon chips, foil, wires, and small tubes. Material: Vacuum-grade aluminum with brass screw. 15 mm (0.6") long with 10 mm (0.4") wide clamping area and standard pin stub 3.2 mm (⅛"). Suitable for holding samples up to 7 mm overall thickness. Perfect for small tubes, strips, wires, and smaller flat samples. Overall Dimensions 23 x 20 x 9 mm (0.9" x 0.78" x 0.35"). Material: Machined aluminum with brass screws. 25 mm (1") long with 15 mm (0.6") wide clamping area. Features standard pin stub 3.2 mm (⅛"). Suitable for holding samples up to 7 mm overall thickness. Perfect for small tubes, strips, wires, and smaller flat samples. Overall Dimensions: 33 x 25 x 9 mm (1.3" x 1" x 0.35"). Achieve background-free imaging and no contact with sample surface in imaging area with this 5 mm recessed clip. Clamping Area: 25 mm (1") long x 15 mm (0.6") wide. Maximum Thickness: 7 mm under the clamping strips. Overall Dimensions: 33 x 25 x 11 mm (1.3" x 1" x 0.43"). Specially designed for easy, quick and clean mounting of any type of thin specimen on specimen stubs. These spring-loaded clips accommodate samples of up to 2 mm thickness. 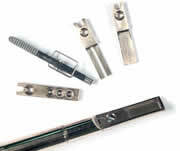 Samples are held securely by small spring-loaded clips and allow for easy change of samples. Adhesives are not required, eliminating possible outgassing issues and saving time. Ideal for holding silicon chips, paper, wire, threads, thin films, sheet metal, etc. SEM Clip Mounts with multiple clips can hold larger samples or multiple smaller samples. For FEI/Philips, ZEISS/LEO, Cambridge, Leica, Amray, CamScan and Tescan SEMs. Shorter version for ZEISS/LEO SEM/FIBs with 6 mm pin height. Available with one, two or three clips. Available with one, two or three clips. For Hitachi. This mount, made from aluminum features an M4 threaded hole and is 25 mm in diameter. The clips are made from copper. The mount comes complete with a Faraday Cup (2.5 mm x 100nm hole) and a gold/carbon resolution sample 3 mm in diameter is included. The gold particle size range is 5-150nm. This block is engraved, numbered 1-10. Measures 12 x 48 mm. Comes complete with pin. This block is engraved, numbered 1-8. Measures 12 x 48 mm. Comes complete with pin. Clips are made from spring grade beryllium-copper alloy. Hole diameter: 2.2 mm (0.087"). Aluminum Mini SEM clamp on a 10 mm, 15 mm diameter M4 cylinder mount. Convenient for holding flat or thin specimens such as silicon chips, wires, foil and small tubes. Screw is M2 x 3 mm, pan head screw, brass. Finder grids for SEM; a valuable tool for analytical studies. The grids are available in 10 mm diameter and they can be placed directly on the stub surface and used to identify the area of interest in which the studies are performed. These new SEM grids are designed to aid in the identification and localization of SEM specimens when placed on standard SEM stubs. Referring to the annular rim identifies north, south, east and west. The four quadrant markers are tapered towards the center. 100 Radial sectors are easily identified by reference to decimal numbers in the annular rim and alphabet letters in the four quadrants. A matte surface on one side is for correct positioning – matte side up. These planchets are prepared from high purity beryllium (min. 98.5%) by electro-fusion to provide vacuum tight (~1x109atm-cm3/sec) and ±10% dimensional tolerances. Beryllium is a hazardous substance. Care should be taken seriously when working with this material. Electron Microscopy Sciences is supplying this material for domestic use only. Not available for export. Unique clamping mechanism secures sample without over tightening. Standard ⅛" pin mount fits most FIBs and SEMs. Peripheral support structure protects specimens during handling and transport. Economical design offers user to prepare and store samples on the same holder. Compatible with Sample Sver™ Stoage containers for secure stoage and transport in an inert environment. Securely holds the Fortress™ Low Profile holder under a stereomicroscope and permits viewing from 2 angles without changing focus on the microscope.